Women Empowerment has become a significant topic of discussion in contemporary society. An engaged women employee not only contributes seamlessly to the organization but also creates a positive work culture around, thereby stimulating organizational excellence. Women are the backbone of the society, they not only support in building homes, communities, businesses but also entire nations. However, this important stakeholder is also the ignored fraction of the same society. To support and provide them with their rightful and dignified status, Jaipuria Institute of Management organized five days’ flagship management development programme on ‘Stri-Shakti: Empowering women for Leadership’ from 11th to 15th September, 2017 at Hotel Park Inn, Jaipur. The MDP was actively participated by 24 senior female officials from various organization like Airport Authority, PNB, Central Coalfield, Power Grid Corporation, Hindustan Copper Limited, NBCC, Aviation Academy and Central Warehousing Corporation. 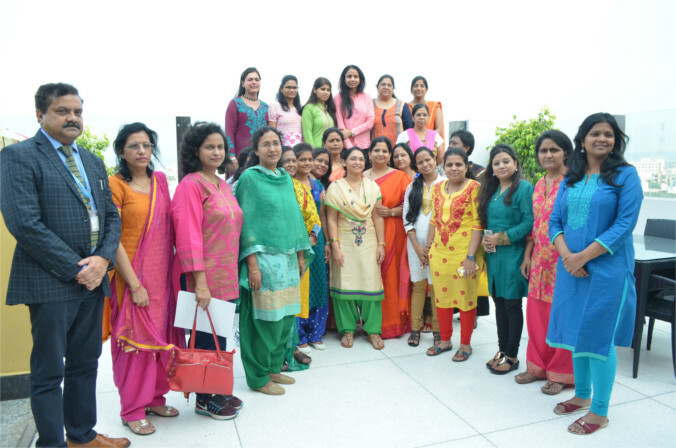 The resource faculty for the programme was Ms. Manjusha Bhatnagar (Director HR & CA-Balmer Laurie & Co Ltd.), Ms Meenakshi Davar (ED-Power Grid), Ms Anamika Sethi (a reputed dietician) and Ms Rashmi (a well-known Image Consultant), Ms. Seema Mishra, Eminent Lawyer, High Court, Delhi and Ms. Seema Gupta, Executive Director, Power Grid Corporation of India Limited. In this workshop, the participant discovered a powerful approach to achieve sustainable progress and success on their empowered journey. The modern woman today is called upon to have multiple perspectives (physical, managerial, psychological, cultural, political and spiritual) and engagement with the family and the organization. The program aimed at discovering insights on the interplay of roles, priorities, choices, and time and productivity management. Imbibe an essential women leadership qualities that are increasingly important in today’s context and inculcate them in self and amongst those around them. The five-days program began with the welcome address and an introduction of the five-day workshop by Vice President, MDP, Jaipuria Institute of Management, Mr. Y P S Kanwar. He emphasized the need of these programs in today’s time as they create a strong foundation for the women for developing and nurturing their inner qualities. The first session was by Ms. Manjusha Bhatnagar, Director of Human Resources & Corporate Affairs at Balmer Lawrie and Company Limited. An HR professional with 34 years of experience in public sector has handled various aspects of HR Manpower Planning & Growth, Industrial Relations & Welfare, Training & Development, and Knowledge Management besides a stint in Information Systems for technology enablement for HR systems. Next sessions were taken by Dr. Anjana Sen on Self Awareness, Gender Sensitivity, Emotional Equanimity and Developing Emotional Competencies. The next speaker was Ms. Anamika Sethi a leading dietician and health practitioner. Ms. Anamika Sethi began the session on ‘Health is Wealth’ by reminding the participants how complicated is a woman’s anatomy. How much care and nurturing does it require. Sessions Sexual Harassment at the workplace and Supreme Court Guidelines were conducted by Ms Seema Mishra, eminent lawyer where she explained various law for workplace harassment. She also took the session on ‘Domestic Violence Act’ and described the act with different famous cases. Ms Meenakshi Davar took the session on maintaining work life balance and creating a culture of excellence where she discussed how one can balance personal and professional life accordingly to achieve excellence in the respective field. Next session was on ‘Building leadership competencies and harnessing their potential’ where she explained that Globalization is rapidly redefining today’s business environment. Significant strategic shifts are transforming the playing field, vast opportunities for growth are emerging at the same time and successful business leaders must shape their organizations to be nimbler and flexible, less hierarchical, and more networked. Next session was taken by Ms. Seema Gupta on ‘Moving forward-the modern women’ where she explained that modern women means multitasking especially when they work. For a modern woman it is important to be supported and that there is equality in every aspect. Dr. Nidhi Vashistha, Professor at Jaipuria Institute of Management, Trainer took a session on Maintaining Work Life Balance and Creating a culture of excellence. She conducted a highly interactive session on the topic ‘Managing Work-Life Balance’. The five-day management development program witnessed a creative culmination. Mrs. Suman Sharma, Head, Mahila Ayog, Rajasthan in the valedictory session focused on Women in Leadership role. In the words of Ms. Suman Sharma “We all are born leaders”. There are times when our halos go dull and that is when is required the support of a mentor, guide, peer, friend and family members to make us realize that the light has just gone dim not out. She shared these workshops are the platforms for women today where experts simply help them realize and recognize this very truth. We all can start from this very second and from this very place. To nurture the leader within you, you have to look and work on your roles in the personal and professional lives.